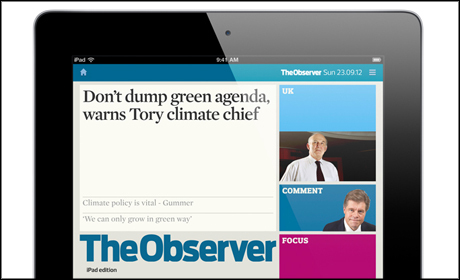 The Guardian announced today that it is re-launching its iPad edition to include the Observer, with the first iPad issue of the Sunday newspaper to be released on Sunday 16 September. As the world’s oldest Sunday newspaper, we’re thrilled to be able to bring our journalism, ideas and debate to a new digital platform in a fresh way, enabling our unique content to be made available to both loyal readers and new audiences around the world. The look and feel of The Observer in the app is very much in line with that of the newspaper and we look forward to hearing our readers’ feedback. The first two issues of the Observer iPad edition will be free, but subscriptions will then apply of £11.99 a month for the Guardian and Observer edition. Alternatively users can select just the Guardian edition for the current price of £9.99 a month or £6.99 a month for The Observer only. This entry was posted in Mobile, Newspapers on September 13, 2012 by Rachel Bartlett.